Music Industry … It’s time to level up. I find that although the music industry is constantly changing – we seem to still be rattling off the same tired and basic marketing advice to artists. Recently, I was tagged in Twitter conversation on the ethics of pay-to-play events. This thread later evolved into a discussion on pay-for-post blog placements, in which I was again summoned by the Twitter-sphere to weigh in on. And while I was honored that my opinion was sought after – I… I just didn’t want to talk about it. Over the past decade, I have spoken on around 5 panels, written countless blogs and gone onto two podcasts to speak on the ethics for pay-to-play. Part of me just felt like if folks haven’t grown, maybe (ahh..) maybe it’s on them at this point. I know, I know. That’s not a great attitude and it can even be dangerous – if we don’t teach them the right way, how will they know they are wrong? I understand that. I do – however, I feel as if the music industry has often become an echo chamber- with the same tactics, advice and even objectives swimming around year after year. This results in not only do artists having the same pitfalls year after year, but industry professionals also seem to be giving out the same tired advice year after year. I feel as if it’s time to grow. It’s time to evolve. If I write an article on why scams are bad – is it really helping anyone? If I go onto a podcast to talk about why grammar in emails matter – am I really preaching anything revolutionary? Going back to the basics is ideal and it’s important. But … when are we going to graduate from Music Marketing 101 and start digging into the deep stuff? Stuff that brings in profit? Tactics that actually move the needle? Systems that we can in place to actually see growth? Recently, I saw an article shared in a fancy industry-only Facebook group I’m part of. 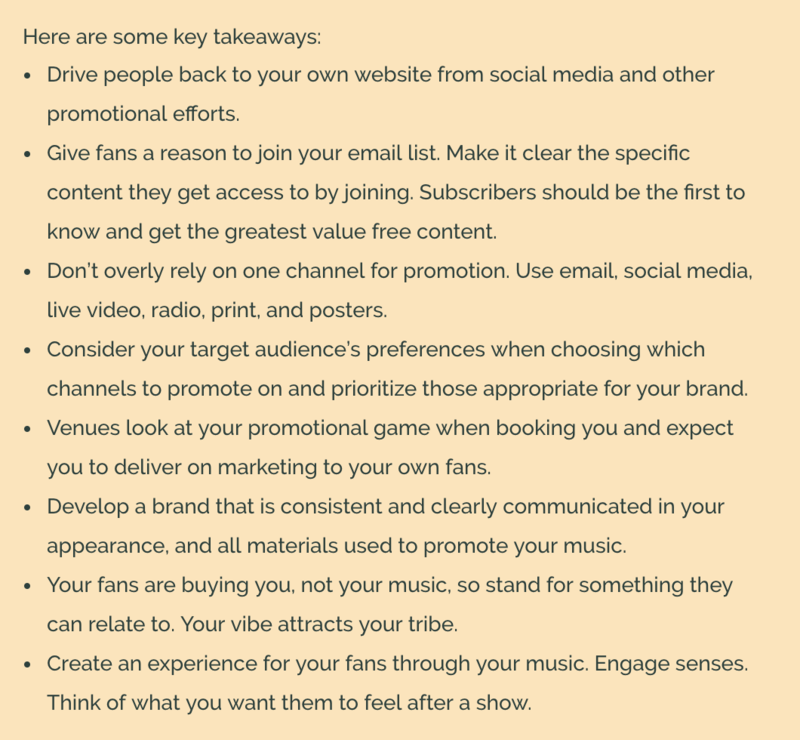 The article was key takeaways from The National Music Industry Summit – I’m tweaking that name a bit for anonymity purposes, but it did have the words National and Summit in it – so I was excited to read what the latest and greatest ideas are from the music marketing world. …. These were the key takeaways. “Takeaways” from a National Summit. .. Not necessarily mindblowing, right? “Give people a reason to join your mailing list!” and “Drive people to your website!” – also, “Use various channels!”. Seriously? Now, granted – I am picking on a single event here. I have been to conferences that had quality speakers and gave quality advice. But I’d say that in 2018 where everyone can be a thought leader if they have a blog and a Twitter page – it’s more elementary advice than tactical advice. Or worse – it’s elementary advice that uses fun marketing words, “Make sure your sales funnels contain not only good content but also good context in order to push leads!” Simple made to sound fancy. Alright, you get the point. So, what’s next? If we shouldn’t focus on the 101-level advice, or we’re ready to move past it – where should our head be? Growth Marketing – Do This, Not That. As many of you know, while the music industry was my first love – I also work heavily with tech companies, startups and other entities that use what’s called growth marketing tactics in order to move the needle. To overly simplify growth marketing – growth marketing is a set of tactics taken to measure the efficiency of your campaigns. So, instead of just throwing out an email or paid ad campaign and hoping it sticks – you’d A/B test various creative, and make notes on what works and what doesn’t. You’d test certain taglines, certain subject lines and in an organized document, you’d review your stats and see what works best. At the end of the campaign, you will have identified your go-to tactics. You also start with a larger goal – i.e., make $30,000 before the end of the second quarter – and then you map out all the smaller objectives needed to get there. Now, this is all a major simplification – there’s much more in creating what’s called a growth engine, but this concept of testing data is certainly needed in the music industry, alongside the digital methods needed to get there. While I’ll need a few articles to really get into growth marketing – I want to give you the mindset of digital and growth marketing. Growth marketing is the mindset – but things like targeted ads, drip email campaigns and more are the “tools” within Growth marketing. I’d like to highlight a few of those “tools” in this article. So, here are a few marketing methods being used today – and the shiny digital/growth tools they should be replaced with. Okay, now I love music blogs. A large part of our services centers around digital PR – however, I’m also a realist and let’s just admit it, blogs are broken. Pay for post dominates the industry, and while some are still good and provide value- I wouldn’t define my success in levels of how many blogs you’re getting on. Blogs are not supposed to be the ‘end goal’, they are intended to be the vessel to get you spins, followers and sales. I’ll reiterate again – blogs can break an artist and they can be huge for artists. However, those need to be able to also share you on social media and have other tactics to ensure that post actually gets seen. So, instead of having to go against variables – try out some direct to fan options as well (note: as well, like … alongside. Blog relations is still something I’d recommend in your arsenal). If you’re into new music, and who … isn’t? Chances are you learned about that new track from a streaming playlist. So, why aren’t more artists tackling Spotify curators? This is a great tactic and a necessary one in the streaming age, but it’s one rarely discussed. While you should likely seek out professionals to assist (hey, I can!) – but it’s also possible to create a curator pitch list from LinkedIn alongside other free and paid sales databases online. I know I’m barely skimming the surface of the possibility of playlist pitching, however, it’s certainly one to explore. Reach out if you’d like more info. When I say email blasts, of course, I’m not referring to well-done monthly news recaps. Keep those. However, there’s another layer of email marketing that I rarely, if ever, see artists doing – and that’s drip campaigns. A drip campaign is an automated email series where if a user does X then they get Y. For instance, if an artist signs up for your newsletter – they’d get a welcome email with a merch discount code. If they use it – boom, great, a sale! If they don’t buy anything in a week, it automatically triggers an email sequence following up, and maybe even offering exclusive content to sweeten the deal. This goes on for a set amount of time. That’s also an easy example. These can get pretty complex – you can have certain email series set for certain products if they intended a show in a specific city – or maybe they bought a hat and you want to do a series promoting your new band tee. I’m using merch examples – but this can be used for anything. Maybe you just want them to click a link to watch a video, or stream a track – all of that is doable, too. Simple set up a series – if they clicked it, you’re done. If they didn’t, they get XYZ until they made that jump. Unless your label has a good ad budget and a quality team, many artists aren’t thinking of ads. Organic social campaigns are important and necessary. In fact, that’s still a basic that I like to preach – fix your content mix, people! However, the way you can detail paid ads these days is really incredible – and pretty affordable. This might be one that you chalk up as basic knowledge – but I’m including as I rarely see artists doing ad campaigns. You can target ads to people who have tweeted a certain hashtag – or to people who follow artists similar to you. Also, you can do this for fairly cheap. Of course, the higher the budget, the higher the reach. But I’ve done quality campaigns for under $500, or even cheaper. Depends on the artist’s goals and needed. So, sure – focus on a consistent content mix – I find that it’s a lost art in 2018, but also look into targeting ads on Instagram, YouTube, Twitter and even Facebook. Do it! Stop: Focusing on labels (or.. anything that isn’t making you $ now). Start: Developing sales funnels to monetize. I love record labels. I do. In today’s industry, it is tough to get by without a team and proper financial backing. However, I find that when artists are so focused on finding an A&R from their favorite label, they overlook the fans that they have today that can be monetized. This isn’t just a label thing either – you may be focused on clicks, views or spins – and overlooking actually sending a fan through a funnel to get some money. So, get your sales funnels together! Putting a link on Twitter is barely a sales funnel – but that’s the main funnel I see. Link to a merch page on social media -> Pop up captures email address -> Email gives them a 20% coupon code -> Signals email drip campaign to push the sale (like the one mentioned previously). Place a video ad on Instagram-> Sends to landing page with full music video -> Spotify subscribe pop up on the page to garner followers. Target an ad towards the city you’re playing in next week -> Bring them to your landing page about the show -> If ticket sale -> Email offers 20% off merch -> Signal drip campaign. Those are some off the cuff examples there’s plenty more. These are some of my go-to digital methods for not only artist, but any marketing entity. It’s vital that we start pushing away the Marketing 101 advice, and start pushing forth with ways to grow and monetize audiences. Want to chat further? Including my contact form below. Look into Spotify pitching campaigns. There is a direct result on your sales as well as your growth if placed. Start being more intricate with email marketing – drip campaigns can result in big sales! Target your ads for genuine growth – rather than sticking solely to organic or non-targeted ads. Keep a log of what you’re posting – A/B test certain variables, and keep tweaking in everything you do.